The Inventory section of the App allows you to create specific Items within specific categories so that you can provide an itemized transaction. Enter category name: Type the name of the category and tap SAVE. Select category color: Choose a color for the category from the list and tap SAVE. Tap SAVE: to create your new category. Edit Categories allows you to delete and edit a category by name and color. Enter item name: Type the name of the Item and tap SAVE. Select category: Choose one of the categories you have created and tap SAVE. Enter price: Enter the price for an individual item and tap SAVE. Taxable Yes or Not: Allows you to turn tax ON or OFF for an individual item. Photo (optional): Attach a photo to the Item by tapping the ADD PHOTO box and form an image in your photo library, take a picture with your camera or cancel. Tap SAVE to complete. Edit inventory: Allows you to delete and edit an inventory item. TIP OPTION: Turning the Tip Option ON will include the ability for customers to add a tip to a sale prior to processing the transaction. With tip off, no tipping is included when processing Sales. TIP DEFAULT %: You can select what the default Tip % is when the Tipping screen is presented to your customer. Select from 10%, 15%, 18%, 25% or None (0%). RELOCK APP TIME: The App will revert to a Locked state after a set period of time. You may enter a time between 0 and 30 minutes or never. Once the app locks, you will need to enter your PIN to open it again if one was set up. E-MAIL RECEIPT OPTION: You can elect to turn ON or OFF the option of offering your customers a receipt to be delivered from the App via e-mail. Turning the option ON will include a receipt screen after the transaction is processed. REQUIRED SIGNATURE FOR TRANSACTIONS BELOW $25.00: Choose to have customers sign for transactions under $25 by selecting ON. Note – all transactions over $25 are required to have a signature. MERCHANT NAME: The name of your business. It will appear throughout the App in various places. TELEPHONE: Your business telephone number. TELEPHONE/FAX: Your fax or second telephone number. WEBSITE: The website address for your business. E-MAIL: The e-mail address you wish to share with your customers. LOGO: This is a graphic that will display throughout the App and on the receipts generated by the App. You can select any image that is within your device’s Photo Library or take one with your camera. The image will be cropped to a square as shown in the Preview during selection. MERCHANT IDENTIFICATION NUMBER (MID): Each merchant is assigned a unique Merchant ID number when their account is approved. If you do not have a merchant account, please contact phoneswipe.com today to get started. VENDOR NAME: The name of your merchant account provider, Phone Swipe. ACCEPTED CARDS: A list of the card types you can accept. TERMINAL ID: Terminal ID can be found on the inside lable of your card reader and starts with S/N T.
APP SECURITY PASSWORD: The Security PASSWORD is used to lock or unlock the App and is required to open the App. PASSWORD must be 5-digits. APP SECURITY PASSWORD HINT: This is a hint that will be displayed when an incorrect PASSWORD is entered 3 times consecutively. SECURITY QUESTION: The Security Question is a question and answer you select that will be asked when you cannot answer the PASSWORD Hint. SECURITY QUESTION ANSWER: Your answer to the security question. Once you are approved for a merchant account, you will be sent a Welcome Letter via email and with your card reader. In the letter, you will find information needed to login and set up your account. Open app and proceed to enter the required information. Once completed, you are ready to start processing transaction. Download app for free from the App Store, Google Play (formerly Android Market), or App World. Once you are approved for a merchant account, you will be sent a free card reader accessory. Additional devices are added as they are tested. If your device is not on the list, feel free to contact us. 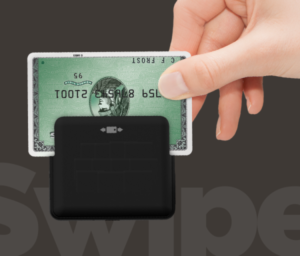 Phone Swipe is compatible with cash drawers and AirPrint-enabled or Star thermal printers. Click here to purchase a Star TSP100 LAN series printer (like the Star TSP143). Connect Phone Swipe to a cash drawer to provide change due. Please note that Phone Swipe works with cash drawers that interface with Star printers. You will need to purchase a compatible Star printer if you do not have one already. Click here to purchase a cash drawer that has MultiPRO Interface 320 (24V). SEARCH – Look up transactions by selecting specific criteria; date and amount range, authorization number, card type and last 4-digits of card number. TOP ITEMS REPORT: A list of the inventory items, ranked by the total amount of sales per item. TODAY’S SALES REPORT: A list and summary of all transactions processed on today’s date. YESTERDAY’S SALES REPORT: A list and summary of all transactions processed on the previous date. THIS WEEK’S SALES REPORT: A list and summary of all transactions processed within this week, starting on the most recent Sunday. LAST WEEK’S SALES REPORT: A list and summary of all transactions processed in the previous week, encompassing the first full week (Sunday through Saturday) preceding this week. THIS MONTH’S SALES REPORT: A list and summary of all transactions processed within this month, determined by the current month as of today. LAST MONTH’S SALES REPORT: A list and summary of all transaction processed in the previous month, encompassing the first full month preceding this month. CUSTOM DATE RANGE: Allows you to select a start and end date to generate a report for that period. A list and summary of all transactions processed within that period will be displayed when you tap GO. Approval: An authorization indicating a transaction has been approved. Decline: The message indicating a transaction has not been approved. A FORCED AUTHORIZATION is used when you are unable to process a sales transaction through the Phone Swipe. Forced Authorizations are only valid for 7 days from the authorization date. To obtain a forced authorization code: You will need to call the toll-free number 800-944-1111 and follow the prompts ending with the receipt of an Authorization Code. Be sure to document this number along with the credit card number, expiration date and the total amount of the sale. Process a voice authorization transaction: Select Voice Authorization. Enter transaction information: Complete the transaction information requested including credit card number, expiration date, voice authorization code and the total amount of the sale. Enter authorization number: Enter the authorization number that was provided over the telephone. Tap CHARGE: This will process the authorized sale. A message will display stating VOICE AUTHORIZATION COMPLETED. Tap OK: You will return to the Start Screen. Creates a new pre-authorization transaction, stopping short of closing or completing the transaction. The final step to completing a pre-authorization transaction, processing an open pre-authorization and closing the SALE. Pre-authorizations are only valid for 7 days from authorization date. Tap PRE-AUTH: This will present 3 options: CANCEL, CURRENT and NEW PRE-AUTHORIZATIONS. Tap NEW PRE-AUTHORIZATION: This will allow you to enter the transaction and obtain the pre-authorization. To process, follow the normal procedures for entering a sale as you would normally. PRE-AUTHORIZATION COMPLETE: When the transaction is processed, a message will display stating PRE-AUTHROIZATION APPROVED – CHARGE NOW or SAVE. Selecting “Save” will complete Part A of the transaction and take you back to the Start Screen. Selecting CHARGE NOW will process the sale. Tap CURRENT PRE-AUTHORIZATION: This will display a list of all the currently open pre-authorizations. Review TRANSACTION: Confirm that this is the correct information and amount for the SALE to be processed. If you wish to change the amount, tap the TOTAL AMOUNT section to edit the SALE. Amount can only be changed to a lower value. Tap CHARGE: The transaction will begin processing. PRE-AUTHORIZATION COMPLETE: When the sale is processed, a message will display stating PRE-AUTHORIZATION CHARGED. This will complete the sales transaction. A REFUND can be processed for SALES that were authorized and settled. Select the transaction to refund: Tap on the transaction you wish to refund or search based on specific criteria by selecting the search button. Review the transaction: Confirm that this is the transaction you wish to refund. Tap REFUND to initiate: A message will appear indicating the refund is being processed. Tap OK: You will have the option to e-mail a void receipt. Hit YES to send e-mail or NO if not sending. A VOID can be processed for SALES that were authorized, but not settled, within the same day prior to settlement. VOIDS are normally processed within a few hours of the time of the original SALE. Select VOID from the Start Screen: A list of recent SALES will be listed. Select the transaction to void: Tap on the transaction you wish to void or search based on specific criteria by selecting the search button. Review the transaction: Confirm that this is the transaction you wish to void. Tap VOID to initiate: A message will appear indicating the void is being processed. Tap OK to finish: You will then have the option to e-mail a void receipt. Hit YES to send and NO if not sending one). A new sale is the process of entering and processing a sale using the ITEMIZE option. Tap NEW CHARGE: The Charge Summary screen will appear. Tap ITEMIZES: To select individual ITEMS to include in the transaction. Select Items: Select any ITEM from the list, or select CATEGORIES to choose a particular category of items. Enter quantity: For each item, use the + or – icons to increase or decrease the number of each item included in the transaction. Repeat for each item: Repeat steps 3 & 4 for each unique item to include in the transaction. Tap SAVE to complete: Once all items have been added, tap SAVE to complete the Itemization process. 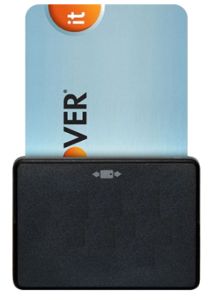 HAND CARD READER ACCESSORY TO CUSTOMER – A message will display instructing you to hand the device to the customer. Tap OK and hand the device to the customer. Customer selects tip amount: The customer can select a tip amount from any of the 4 default percentages (10%, 15%, 18%, 25%) or enter a custom amount by tapping CUSTOM. Once selected, the customer taps OK. A message instructing the customer to return the device will appear. Tap OK when you receive the device back from the customer. If Using Card Reader Accessory: Swipe card with hardware card reader: Swipe the card as shown on the card reader accessory. After the card is read, the screen will display PROCESSING. Skip to Step 9. If the card is unreadable, you can enter the card information manually – continue to Step 11. If Not Using Card Reader Accessory: Manually enter card information: If the card reader accessory is not present, or the card cannot be read, tap ENTER CARD MANUALLY. Invoice Number (optional): Enter your invoice number if desired. Tap CHARGE: To complete the charge request, tap CHARGE. The screen will display PROCESSING while it contacts the processing service. Response: A response will be displayed indicating the status of the charge. Please refer to the guide for further information on declines, referrals or pick up responses. When approved, hand device to customer for signature: A message will display instructing you to hand the device to the customer for their signature. Tap OK and hand the device to the customer. If you choose not to require a signature for amounts under $25, this screen will not appear for transactions under $25. Customer Signature: The customer signs their name in the space provided using their index finger. Tap OK once the signature is complete. A message will display instructing the customer to return the device to you. If you choose not to require a signature for amounts under $25, this screen will not appear for transactions under $25. If Receipt is On (Otherwise skip to Step 18): Receipt Options: If the Receipt Option is On, a Receipt Screen will display with the option of gathering the customer’s name and e-mail address. Ask the customer if they would like to have a receipt e-mailed to them. If YES, enter their information by tapping on the text for each. Ask the customer if he or she would like to have his or her name added to your e-mail mailing list. Inform the customer what your email address is and tell them to add your email address to their address book to ensure your email doesn’t get sent accidentally to their spam folder. If NO, slide the switch from OFF to ON. Tap E-MAIL RECEIPT to send the receipt, or NO THANKS to continue without sending a receipt. End of Transaction: A message will display indicating the transaction is complete. Tap OK to return to the Start Screen. The transfer of funds from a cardholder’s account to the merchant’s account for services or products received. A transaction where the card is passed through a credit card terminal and the magnetic stripe is read by the terminal. The three- or four-digit number typically following the account number, located on the signature panel on the back side of most credit cards. However, CVV numbers on American Express cards appear on the face of the card above the card number. A transaction where money from the merchant account is transferred to the cardholder’s account; the reverse of a sale. Also called an authorization hold, pre-authorization occurs when the cardholder’s bank immediately authorizes a credit card transaction but holds the funds as unavailable from the merchant until he or she officially clears (settles) the transaction. This allows for changes in the sale amount that might occur between the time of authorization and settlement. Example: Hotel stays where last minute phone calls or room service use could affect the amount of the final bill after checkout. Cancels the completed transaction and removes it from the batch so it does not go out for settlement. An account established by a merchant for the purpose of accepting credit cards as a form of payment. The hardware used to swipe a card. It attaches to your smart phone or iPad.